Rep. Scott Taylor speaks during the annual State of Our Waters event on Thursday, May 31, 2018 in Melfa, Virginia. The State of our Waters' purpose is to discuss the latest news about the Chesapeake Bay and Atlantic waters and to give Eastern Shore residents a chance to question state and federal officials and scientists about water quality matters. 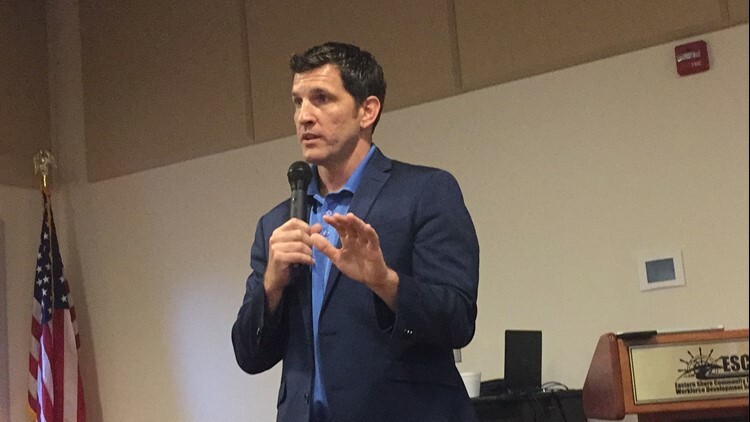 MELFA, Va. (Delmarva Now) -- Rep. Scott Taylor was one of three keynote speakers at the annual State of our Waters meeting at Eastern Shore Community College. "There is a significant amount of work to be done to achieve our goals by 2025, and to be frank, we have already picked the low-hanging fruit," said Shorekeeper Jay Ford, who kicked off the event and introduced Taylor, along with Matt Strickler, Virginia Secretary of Natural Resources, and Mark Luckenbach of the Virginia Institute of Marine Science. "Work between now and 2025 will require a collaborative effort between our state, local and federal officials and our scientific community," Ford said. 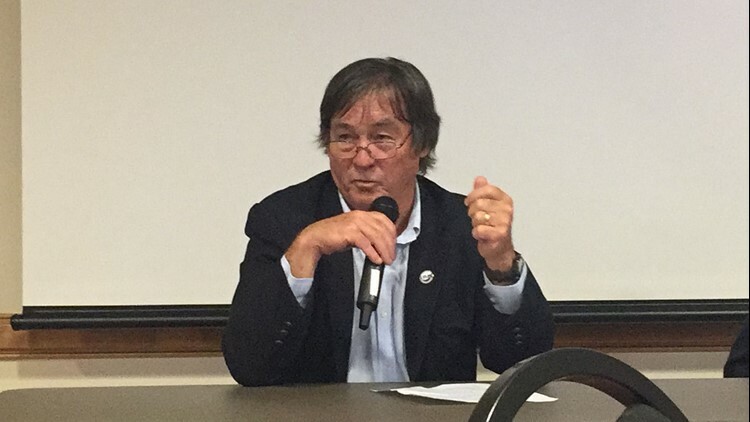 Sen. Lynwood Lewis, also speaking at the event, said, "Nobody ... in the entire Commonwealth has a greater, keener interest in a healthier bay and healthier water quality than an Eastern Shoreman does. It's not only important to us economically, it's important to us culturally. It's part of our heritage, our history — it's in our blood." He noted about $6 million for oyster restoration is included in the state budget the General Assembly recently approved. The 2018 event marked the fifth annual one. Taylor noted his membership on the House Appropriations Committee helped get funding for the Chesapeake Bay cleanup restored in the 2018 budget after the president's budget had slashed that funding to zero. "It's important to have a seat at the table," Taylor said. Mark Luckenbach, Associate Dean of Research and Advisory Sciences, VIMS, speaks during the annual State of Our Waters event on Thursday, May 31, 2018 in Melfa, Virginia. Taylor also said he supported NOAA's national Sea Grant program. Taylor got a round of applause when he reiterated that he has officially come out against offshore drilling; still, he said about the process of taking inventory of the nation's offshore resources, "I don't actually think it's a bad thing. I think it's a smart thing to understand what our nation has." In Virginia, he said, "From my perspective, you've got many of you who just clapped; you've got city councils; you have the military that has an issue with it, the fishing industry, you have the tourism industry in our area — are very much opposed to it." Taylor said the Virginia delegation in Congress "is not 100 percent opposed to it." Still, Taylor said, "In my gut, I think we are going to be fine." Taylor also noted his sponsorship of legislation that would establish a Center of Excellence in Virginia to address sea-level rise. "The Hampton Roads area, and obviously some of the Shore, too, is only second to Louisiana in sea-level rise and the issues that that brings," he said. Strickler said states in the Chesapeake Bay watershed are "just past the mid-point" of the most recent multi-state commitment to improve water quality. "We are making very good progress," he said, noting the most recent assessment showed "we are far exceeding where we need to be" as far as goals set for reducing pollutants coming from wastewater treatment plants by 2025. Still, the bay cleanup effort is now entering its third phase, which will include "some of the more challenging issues," including dealing with non-point source pollution from agricultural runoff and suburban and urban stormwater, Strickler said. The state is engaging with local planning district commissions as well as soil and water conservation districts to give them financial and technical support so that those bodies can help "put together the plan for how we are going to get through this next phase of the Bay cleanup," he said. Luckenbach, VIMS associate dean of research and advisory services, gave the scientific perspective. "Bay-wide, with respect to water clarity, there has really been a significant improvement," he said, noting water quality standards have been fully met for 40 percent of the bay. "Many practices are in place already that will take that further; it just takes some time for that to happen," he said. As water quality improves, progress is being made on reducing the size and duration of the "dead zone" in the bay, which varies from year to year. 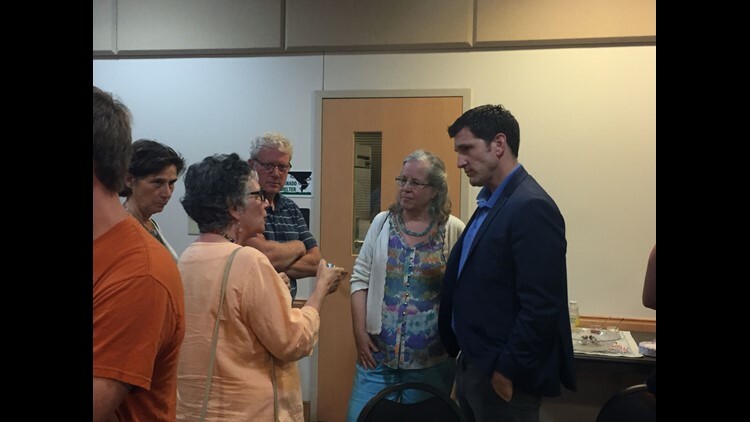 Rep. Scott Taylor, far right, speaks with constituents before the annual State of Our Waters event on Thursday, May 31, 2018 in Melfa, Virginia. Luckenbach echoed Strickler's comments about the challenges of meeting the goals for reducing non-point source pollution. Still, he said, "It's important to note that, really, all the sectors have made improvements, including agriculture, including urban and suburban stormwater management. It's just that there is a lot more to do in those areas because they are more diverse and spread out." Luckenbach also noted the expansion of grasses bay-wide, with just more than 90,000 acres of submerged aquatic grasses in the Chesapeake Bay now. "That's halfway to the 180,000 target," he said. Additionally, on the Eastern Shore's seaside, submerged grasses also are rebounding, mainly due to active restoration efforts — with more than 6,000 acres now growing there, "which may even result, if we're fully successful, in the re-establishment of a bay scallop population," Luckenbach said. Oyster populations in area waters on both the bayside and the seaside are on the rebound "to a significant extent," in large part due to better management and active restoration efforts, he said. Another positive is the slow but sure increase in the use of living shorelines and other nature-based solutions to erosion. "We could still do a lot better here, but these are the kinds of things that have a way of starting slowly and building a lot more rapidly," he said. Among the greatest challenges facing the bay is an expansion in red tides — algae blooms that often are toxic — which appears to be at least in part the result of rising temperatures, Luckenbach said. Additionally, more and more Southern species are taking up residence in the Shore's coastal waters as temperatures rise. "This isn't necessarily all bad ... but it does present us with a need to better understand the ecological changes that are underway and how we are going to cope with those" in terms of habitat and fisheries management, he said. Rising temperatures and variable precipitation patterns also will make more difficult future efforts to improve water quality and reduce the dead zone, Luckenbach said. Luckenbach also spoke about VIMS' efforts to address residents' concerns about the effect of industrial poultry farms on water quality. "We have a plan; we have some techniques. We are moving forward this summer sampling in selected creeks. We are looking at a particular biological indicator," he said.